I’d grill but it’s been rainy and drizzly for several days. This rain makes me want to bake. Of course. Poor me. I’m stuck with only my stove-top, electric skillet, fryer, blender, food processor, and crock pot. As you can see, I’m practically without any options. I think I’m getting my dream stove/oven out of this!!! I’d never shared these dreams with him before. But knowing how much I cook and bake (which of course benefits him greatly), and how lame our stove/oven have been for so many years, I think Matt decided it was time to fork it out for a quality appliance. I might have started acting like a five year old who was getting a double oven for Christmas. Sure, it was hard for me to think about paying extra for my dream range. But we were going to have to drop some money on a new range anyway. Might as well get the one that benefits our family and guests the most. Won’t that just be so much fun? In the meantime, I still don’t have an oven. One doesn’t drop that much money without first doing research to decide which is the best option for purchase. (We’re looking at one like this. It’s one of the least expensive, if you can believe it. Cha-ching!) While I’m waiting for the range to come in and be installed, I decided to make a list of non-oven great food options. There are hundreds. I’ll just make a list based on what I have on hand and what is on sale this week. Funny, by the way, that since I know I can’t bake, all I can think of are foods I want to bake. That’s the main reason I’m making this list. I have to get my mind off of cake. Whole Wheat Tortillas since I can’t make bread. I had decided that breakfast is the trickiest, but as I look through this page of Breakfast Recipe Ideas, I’m finding quite a bit to work with. I have no idea why I’m making this hard. I’m just spoiled, that’s all. In case you’re interested, this is what I have in my kitchen. These will all be used double time this week, you can be sure! As you can see, I’ll still be able to make huge messes in my kitchen and my children won’t even starve while I am without an oven. There are loads of options. As soon as I have gas, I’ll let you know. If that isn’t something to look forward to, I don’t know what is. Do you have any non-oven recipe ideas to share? How about double-oven purchasing advice? Gas related thoughts? Really. I’m open to just about anything you’d like to share. Try skillet spaghetti from Amy’s Finer Things. It makes a lot, and it’s all in one pan. Congratulations on the upcoming oven! I’m sure it will be worth the wait! Take your favorite, largest roasting pan with you to shop and make sure it will fit (my mom is currently shopping for one too and that’s what she’s doing). Also: convection and center burners are awesome :) If you have room in the kitchen, you might look at one of the 36 inch models that have 6 burners. I can ask her what models she’s been looking at and why if you like. So I am seeking the best way to make hamburgers indoors for our family. I used to use a tiny Foreman grill, but it had pooped out finally. Since those kind of grills have non-stick plates, I was considering a cast iron grill pan for the stove top. However, I don’t have an exhaust fan over my stove (house is ancient, long story!). Is this asking for trouble? Would love for those of y’all with cast iron grill pans to let me know! I don’t know if it’s possible but could you do gas range & electric oven? My mom hates gas ovens. Takes forever to heat up & doesn’t always cook evenly. I have always had electric ovens and they work beautifully. Just a thought!! Hmmm, good to know. I don’t think there’s a way to have gas and electric at the same time in a free standing range like I’m looking at. Here’s hoping I’ll adjust to a gas oven and love it! I agree with this comment! I am fortunate to have gas upstairs (ha) in my kitchen where I do stovetop stuff and then downstairs I have a 2nd stove/oven that is electric which I use for all my baking. My gas oven is useful though, for storing stuff! I would definitely look into a gas/electric option if it is at all possible, Laura. Just my opinion. Oh yes, and the electric oven does have that “set it to start” option. We use that a lot for meals after church on Sundays. This is too funny… our oven went out too. We went to Sears and got MY dream oven too. I wanted a convection oven with an option to start baking at a certain time. My current oven didn’t have that so I was shopping just like you. It felt like Christmas. Good to know that my craziness is not just me! :-) Happy shopping! The oven is gorgeous!!!! In our last house we replaced all of the appliances with “Slate” and loved it!!!! It doesn’t smudge like stainless steel and looks more elegant ???? Can not wait to hear how having gas changes your life!!!!!!! We were without our oven for about a month, and besides the slow-cooker, we learned to bake in an electric roaster. I have two so it wasn’t too bad, but we made due and we all learned that muffins taste just as good as being baked in the real oven. Just takes a bit longer. About the double oven… We looked at them a few years ago because I thought it would be great (I still think it would), but I get muscle spasms in my back and the thought of taking a turkey out of the lower oven was enough to make me think twice. So I went with the largest capacity oven at that time. For me it was good. I also skipped the convection because I thought it would just be one more thing that could go wrong with it. However, I saved the racks from the oven we replaced because they fit in the new oven and add them when I need more room. I just move the pans around during baking if needed. My dream would be to have a double wall-oven, then that turkey would be much easier to handle! Love the blog! Thanks for all the recipes and info. Hi Kim. Thanks for your post. I didn’t like how low the bottom oven was when we were shopping. We’re in the market for a new oven as well, and looking into gas since I’ve heard such great things about it. I thought the double oven would be great until I tried to imagine our huge Thanksgiving turkey fitting in one of them… not so sure that would work. )-: Also, hard on the back (as someone has already said). If I could redesign the whole kitchen, I would love a double oven on the wall and a counter-top range, but that is not an option. Also (and this is silly, I know) … why does the interior of the LG have to be an obnoxious bluish-purple color??!!! Not super important, but it just bugs me! Congratulations on the new oven! 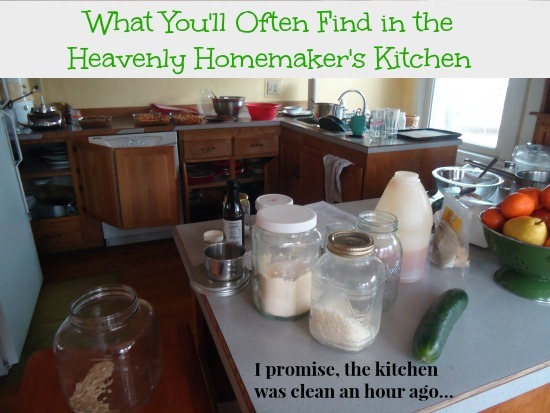 Your post made me laugh and remember when my husband and I were newlyweds without a kitchen. We had a fridge, a slow cooker, an electric skillet, and a toaster oven. It seemed that I was always thinking of meals I couldn’t make! 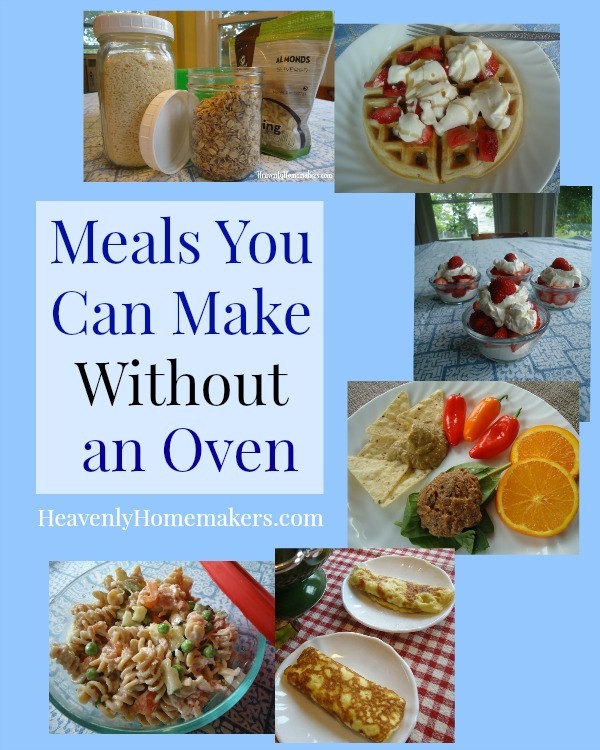 And when we finally splurged and bought a muffin tin that fit in our toaster oven, my poor husband had to eat every meal in muffin form for about a week! I was so excited. Those are good memories. So happy for you getting gas! I hate not cooking with gas. I’ve only had to do it in one house for about two years, but did not like it. at. all. Any plumber will be happy to install a line for you, and in my mind, it’s worth every penny! You never even mentioned the outdoor grill! It’s rare that I use my oven for cooking meals, mostly baking. Those things that I DO cook in the oven are things like lasagna (which you offered a skillet version), meatloaf and stroganoff (just had venison stroganoff on Sunday and was thinking it should be a ‘winter’ meal — but it was still delicious). I mostly use my crockpot, stovetop (gas, of course) or grill (if it’s not buried in snow – charcoal, by the way). I always wanted a double oven but my the time we can get one it will be just my hubby and I . So excited that you get a new stove/oven. Just remember give yourself grace from going from electric to gas. Instead I opted for a warming drawer. It looks just like a storage drawer, but it’s used for keeping already cooked food hot and ready. You can imagine the utility at the holidays, but I use it all the time. Hubby running late? Pop the casserole in the warming drawer. Schedule craziness means we need to eat at different times? The serving dishes all go in the warming drawer and food stays hot for hours. I also opted for the dual-fuel model. I have the best of both worlds, an electric convection oven and a gas cooktop. With the convection feature allowing me to cook/bake on all 3 racks and the warming drawer down below, I have so much more flexibility than I would with 2 ovens. It was very expensive, but we were opted to wait until Labor Day when our local appliance store put it on sale for 25% off. If you can hold out until the Memorial Day sales, you can likely save some serious cash. Also look into rebates programs from your gas company. Ours gave us $400 for switching from an electric to gas range. One word- Ebates! We used Sears & Kmart recently for big purchases and the cash back from Ebates as well as the points from the Shop Your Way Rewards were significant. And there are often additional coupon codes on the Sears site for appliance purchases or purchases over a certain dollar amount. Sometimes we purchase gift cards at our local grocery store for the store where we will be making the purchase and it earns us gas points (ha, another gas reference)…just some more ideas! Keep us updated! We are all excited for you! Jealous!! I’ve said when our stove/oven finally poops out and can’t be fixed anymore (we’re like you, we hang on to things until they can no longer be fixed) I want a double oven too. When my husband and I were first married we lived in a little rent house that had an old range with a double oven, one big, one small. I loved it, because not only could you bake more, but if you only needed to bake say, a pan of biscuits, you could just heat up the little oven which didn’t make the kitchen as hot as heating up the big one (a big deal in the summer when you only have one window unit for the whole house and it was nowhere near the kitchen). Hello Laura. My cousin’s wife really likes her gas stove. Our $50 stove worked so well but did break down last month. We’ve invested in a “true convection” (no gas lines here); caching-caching on sale. There wasn’t anything second hand in our area. I love being able to bake double bread (fantastic). Still trying to figure what bakes best on convection and off. We looked at double stove but we bought this one because I can fit two of my canners on top. You’ll love the top for cooking. Most chef’s and bakers love their’s (it seems). I have a Maytag double oven–gas–, and I LOVE it!!! I will never do without a double oven again–even after the kids are all grown up. The ability to bake bread in the bottom oven and bake the casserole in the top oven at the same time is wonderful! I can bake 3 pizzas at the same time. My bottom oven is large enough to hold a large roaster pan. I don’t know if all the double ovens have a large bottom oven, but mine does. Also, I’ve always wanted a double oven! We have three boys and a girl but the oldest is only 5, so I hope I have a few years before I can’t keep up with feeding them! Ha! Ha! My oven died yesterday. I had just finished cleaning it (of course!) and the heating element snapped apart. It’s a ’60s era built-in type, so replacing it will be an expensive adventure. Congrats on your gas, times 2! Bring on the summer salads! We are holding out for a dual fuel oven/range (gas cooktop, electric oven). My hubby is convinced it is the best way to go – more expensive, of course! We will probably get it from a scratch and dent store when we decide to finally do it. I have a gas stove/oven and I love it! It’s Frigidaire with 5 burners on top (and came with a griddle that fits on the middle burner – I use it all the time). I think we looked at the double ovens, but decided the single would work just fine. I just have to plan ahead a bit when I’m doing lots of baking at a time. I have a double oven similar to that one you linked to, except it’s a smooth top and not gas. We would have had to get a propane tank in the yard, so we decided to stick with electric. I LOVE having two ovens. Not sure what I did without it! It’s so nice to be able to cook 2 things at 2 different temps at the same time! Yes, getting things in and out of the lower oven is kind of annoying, but to me it’s worth it to have two ovens. So just keep that in mind, that you may be bending over further/squatting down using that type of even. You’ll have to decide if that con is worth it to you. I also love the programmable features on mine. Not sure if they all come with it, but it’s really nice to be able to stick potatoes in the oven and set it to start an hour before we get home, and set it to turn off in case we run late. Some have said that the ovens are smaller. Perhaps they’re all different, but while my top one is pretty skinny, the bottom is plenty large for a turkey roasting pan. Make sure you “test out” whatever you end up getting to make sure it’s the size you need! You get the biggest THANK YOU ever for suggesting that we check Craig’s list!!!! We thought it would be a long shot to find exactly what we’re looking for (we live in a small town). But we found EXACTLY WHAT WE’RE LOOKING FOR!!! 45 minutes away. Practically brand new. It’s clean and beautiful and the price was amazing! So thank you!! Soon I’ll have gas. And I have the prettiest double oven too!!! Congratulations! I finally upgraded to gas last summer (36″ cooktop) and I am SO happy! 36″ is a must if you need to use multiple large pans at a time and a double wall oven (electric). Word to the wise, make sure the gas burners can go low enough. Our Thermador boasts power, unfortunately, even with the lid off on the smallest burner, pots still boil, sigh. Hopefully, there are some ranges out there that can go low enough to keep things warm or barely simmer. Though supposedly high end cookware (All-Clad?) can help, with temperature as well. Also, make sure you have a good vent hood, as you should run it whenever a gas burner is on. Laura! I have that same oven that you’re leaning toward (although electric because we don’t have gas at our house). I LOVE it. It has been amazing! Get it! So frustrated because tenants are at the mercy of the property owner who is reluctant to make repairs. OK so what can I cook in the microwave besides burritos and other frozen stuff? Tired of sandwiches after six weeks of not having a functional oven, now the stove-top is disabled. I will look at the links in the article above for some ideas.